How often do you visit a place and you want to remember easily next time to go back there, but don’t have an easy way of doing it? Well Now, you do. Do you often run into situations, you want to share your place with your friends so they can locate you or come meet you? 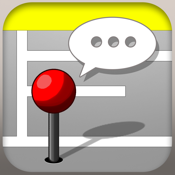 Do you want to share your location with your friends or family while you are on the road so they can plan accordingly? There are a lot of icons that act as visual descriptors of the location along with the name of the saved place. It will also allow you to open specific location in the maps app, email your location. By default, it will also time stamp when you added a certain place. Additionally, it will also give latitude/longitude to pin point the exact co-ordinates of the location. We strongly encourage you to give us your feedback on what features you would like to see in our next release.